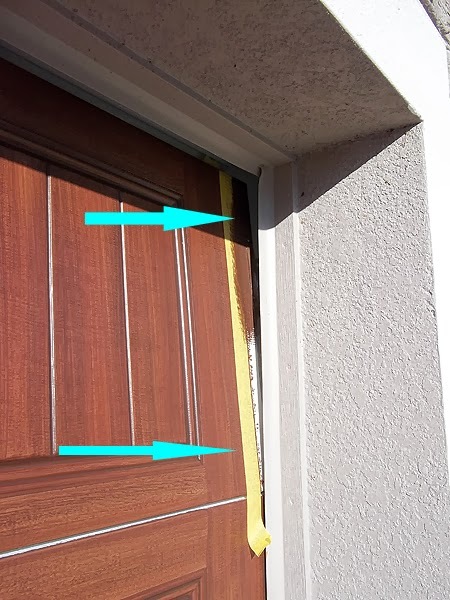 One of the challenges of faux painting a garage door to look like wood is how to paint the area on the door that is covered up by the weather stripping. The only time you can see this area is when the door is being opened or closed and you will only notice it at the top of the garage door opening. It may not bother most people but it seems to me it's better if you do not see that white stripe there. Now most of the time the way I handle it is to open the door all the way and put a ladder up and then get up there and lean over the opened door and paint it in. Because you only see it fleetingly I paint that white stripe in a solid dark brown, I do not try to wood grain it. Using a ladder works most of the time but a significant amount of the time a ladder will not work out because there is not enough room because either the roof of the garage is too tight to the opened door or there is no room along the sides of the door to put a ladder. Take a look at this first picture. The door is right up against a wall. So when the door is open there is no room to get up there and paint in that area. I typically wait until the door is done and deal with it. 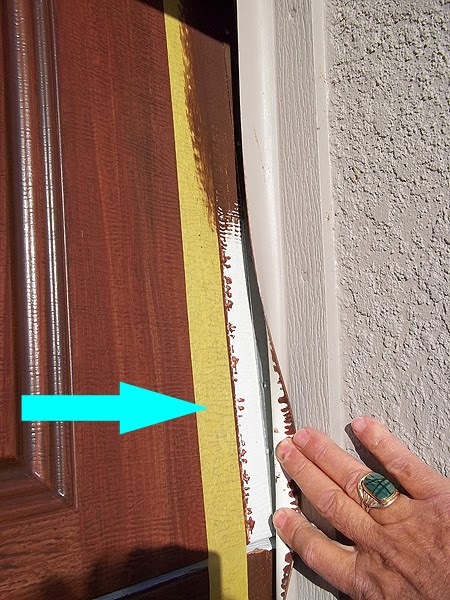 What you have to do is open the door very slightly, just enough to separate it from the weather stripping. I use a tape line to mark it off. I put the tape so when I paint the area in it overlaps about a 1/16th of an inch or so onto the work I have already done. 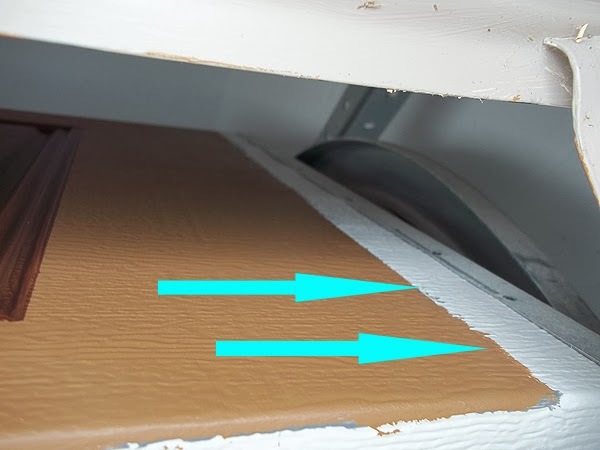 Most times I have to hold back the weather stripping to get at the area but after you open the door some the weather stripping doesn't touch the door. You have to do this for each row on each side of the door when there is no other way to get access to the area. The easiest way to paint in the white stripe area is for the door to be open and use a ladder. But when I paint a garage door to look like wood I frequently have to use this technique.